Previous articles have described the operation and construction of the cut out. To recap, it is simply an electromagnetically operated switch having two windings. The shunt winding has many turns of thin wire, is connected across the dynamo output and is used to close the contacts when the dynamo rotates sufficiently quickly. The series winding has few turns of heavy wire, is connected in line to the ammeter and battery and is used to force the contacts open when the output of the dynamo falls. Recently, a failed cut-out became available as a candidate for deeper investigation and possible repair. It was a type CF1 from a Chummy, but the principle is exactly the same for all common types on the Austin Seven. It was known to be faulty as the shunt winding was open circuit, and not the anticipated 33-39 ohms. The conclusion was that as it was already faulty, dismantling was no further loss; if possible, a repair would be a bonus. The cut-out was stripped down so that the central bobbin could be accessed. Note that there is a mixture of 2BA and 3BA nuts, using solder as a crude anti-shake technique. The shunt winding is underneath the series winding. Therefore, the series winding had to be removed to examine it. The series winding was carefully unwrapped; not in order to save the wire, as the insulation flakes off when it is bent, but in order to count the turns and note the direction of winding. The series winding wire was measured as being 1.65mm in diameter: this corresponds to 16SWG (Standard Wire Gauge – Note: NOT American Wire Gauge). The turns were counted: 17 per layer, 3 layers which, allowing for a bit of bending at the start and finish, gives a total of 50 turns. The bobbin was marked to show the direction of winding. Having exposed the inner shunt winding, the cotton retaining thread was removed and the unwinding began. The inner wire is 0.22mm in diameter, approximating to 36SWG, (35SWG is nearer but no longer easily obtainable). A quick calculation based on the wire thickness gives the number of layers at about 36. Each layer has 140 – yes they were counted! - 140 turns. This equates to a grand total of 5000 turns containing over 100 metres of copper wire ready to spring off the bobbin. At this point, it became clear that re-wind without a coil winding tool, or at least a lathe with a low torque slipping clutch, is simply not an option to the home restorer. However, a piece of very good fortune showed the break to be at the end of the top layer. It was concluded that the magnetic field strength wouldn’t be reduced by too much by simply removing the one damaged layer. The damaged end of the winding was insulated from the remaining layers by some thin PVC carpet binding tape. The connecting lead to the terminal post was re-soldered, having first removed the varnish with some 600 grit emery paper. The joint was covered by a second piece of tape and the connecting leads reinsulated with heat shrink sleeving. New winding wire can be obtained mail order from Maplins. As stated above, reuse is not possible due to the insulation flaking off. Moreover, it is not possible to re-wind using kinked wire – and 16SWG is very stiff and difficult to form once bent. A temporary mandrel was made up from a coach bolt, so that the payoff reel could be held in a vice. Starting at the stud mounting end, and leaving a tail long enough to reach the A terminal, the wire was rewound, carefully ensuring that the direction and number of turns was correct and that the windings were tightly packed. This is essential if the correct number are to be rewound. Even so, the irregularity of the outer diameter of the shunt winding made this quite difficult. The 16SWG has a tendency to spring back to its delivered diameter, resulting in loose turns. These must be corrected as winding progresses. The wire is quite stiff and requires considerable hand pressure to prevent it unwinding as the grip on the bobbin is relaxed. No matter how carefully this is done, the winding diameter inevitably increases due to imperfect packing. 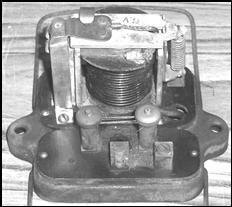 Once the 50 turns had been rewound, the top end was cut and re-soldered to the terminal near the armature. The start of the winding must be insulated using a short piece of heat shrink sleeving to prevent chafing against the armature support frame. The completed re-wound mechanism can then be returned to the insulating plate. Whilst dismantled, it is a good idea to clean under the square headed screw as this forms one of the contacts to the points. Finally, a blob of solder on each screw acts as an electrically conducting locktite. In conclusion, if an open-circuit cut-out needs to be repaired, it may be possible to identify the break in the shunt winding, repair it and re-wind the series coil. However, if the break in the winding has not been located within the first four or five layers, the winding should be entrusted to a professional having the tooling to make a proper repair. 3. Second winding: 50 turns, 16SWG, 17 turns per layer, 3 layers. Start at bottom leaving 10cm tail to connect to “A”; finish at top and connect to armature contact. Wind anticlockwise as viewed from Armature. The shunt winding as an impedance of about 36 Ohms, which means that at 6V approximately 160mA flows in the winding. Thus it produces 0.16 x 5000 Ampere-Turns of magnetic attraction. In order to counteract this, the force in the series winding must be equal but opposite. As the winding has 100 times fewer turns, this would occur at 100 times more current, about -16 Amps. The reason the cut-out operates at a lower reverse current, as seen on the ammeter, of somewhere between 5 and 10 Amps is that the spring on the armature acts to assist the unlocking action; hence the “drop out” current is significantly lower than the theoretical 16A. This article, written by Geoff Hardman, originally appeared in CA7C Seven Focus in Jan 2007 pp18-20.